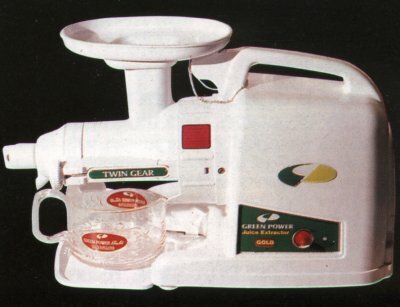 Green Power Juicer SPECIAL LOW PRICE - LIMITED TIME SPECIAL! Did you know the Green Star Juicer is the new and improved version of the Green Power Juicer? It uses the same twin gear technology, and has a longer warranty. Learn more about it here. See a comparison of the two machines here. Dark Green juices are essential for our health. Unlike current popular juicers, Green Power is designed to extract green juices. In fact, it produces high volumes of green juice with tremendous ease. It juices continuously without plugging up, and the the pulp comes out dry. With its unique Twin Gear press, Green Power is able to get juice from all leafy greens and herbs, fibrous plants and grasses, and tough, stringy vegetables and sprouts. Green Power juices virtually every vegetable and fruit imaginable, making other brand name juicers obsolete. Independent laboratory tests confirm that Green Power's Twin Gear Press technology extracts a substantially higher mineral content than leading juicers. Concentrations of essential minerals like calcium, iron, and zinc are found to be 50%-200% higher in juice from Green Power than in Juice from other juicers. Now, your commitment to drinking raw juice can really begin to pay off! Green Power slowly and gently presses out your juice. There is no wildly spinning basket or destructive high speed chopping blade. Heat and impact shock are virtually eliminated, so oxidation is significantly reduced. The result? More of the delicate nutrients survive, and live enzyme content is increased up to four times! Now you can juice just once in the morning, and drink high-quality, enzyme-rich juice all day long. Truly the breakthrough we've all been waiting for. Not everyone has access to organic produce. Once again, Green Power comes to the rescue. With common high-speed juicers chemical residues tend to be flung right into the juice. However, numerous experiments by Dr. Norman Walker proved that when vegetables are slowly ground and compressed, toxic metals with high specific gravities (e.g. mercury, lead) naturally bind with cellulose(pulp) and stay out of the juice. Yet another way in which Green Power delivers the healthiest possible juice. Let's face it. Some high-potency green juices are less palatable than others. Yet you don't want to forego their tremendous health benefits. Green Power's strong magnetic field actually mellows the taste of these powerful juices so you can drink them without making a face. And all juices, whether pungent or not, come out with a noticeably fresher taste due to Green Power's magnetizing effect. Yes, the juice from Green Power is not only higher in nutrients and enzymes, it even tastes more alive. The rate of absorption of juice has never been considered a factor in comparing juicers. With the introduction of Green Power's magnetic Twin Gear press, this has now changed. Experiments conducted by the Green Power Co. Research and Development Dept. show the rate of absorption of green juice using dual gear extraction is up to five times greater than using centrifugal extraction, as shown in the chart below. Who ever heard of a juice extractor that can juice wheatgrass and make pasta, baby foods, desserts, mochi and nut butters? Green Power does an excellent job of grinding all your raw nut butters, like almond and sesame, without heating them. Once you've tasted these fresh, you'll never buy them in the jar again. All your sprouted grains like wheat and spelt go right through nicely and come out with a smooth texture. Delicious frozen desserts like banana ice cream come out just perfect. Green Power is by far the most versatile juice extractor on the market today. Grand Prize Winner-9th International Invention/New Products Exposition, Pittsburgh, United States May 1993. Silver Medal Winner-International Exhibition of Inventions, Nurnberg, Germany March 1993. Winner of Korean President's 1st Prize-93 Invention Day, May 1993. You may be considering a live-food lifestyle with more enzyme-rich raw foods in your diet, or a juice therapy program that includes nutrient-packed dark green juices. If you find that your present juicer simply cannot meet your juicing needs, Green Power is the solution. Green Power or Green Star? Want to know which to buy? 1. Low RPM rating An operating speed near 100 RPM is excellent. Juicers with higher RPM rating create heat and impact shock, and tend to destroy much of the enzyme and nutrient content in the juice. 2. A Powerful Motor A low-powered motor will vibrate, make noise, sometimes overheat, and eventully burn out. Green Power has a strong, smooth, precision-balanced motor designed to last a lifetime, even under heavy use. 3. A Wide Range of Juicing Abilities Wouldn't it be nice to be able to make your juice early in the morning without waking up your family members? It is no surprise that noisy juicers don't get used as often as quiet juicers. Green Power is whisper quiet. Even under heavy use, it is as quiet as your refrigerator motor. You'll enjoy using Green Power. 4. A Wide Range of juicing Abilities It is important to select a juicer that will process the widest range of health-promoting herbs, plants, vegetables and fruits. A limited juicer will give you limited health benefits. Green Power has no difficulty juicing the hardest herbs or the leafiest greens and everything in between. With Green Power, even wheatgrass is no problem! 5.High Nutrient and Enzyme Content in the Juice. Low RPM triturating juicers and hydraulic press extractors produce juice with the highest nutritional content and the longest shelf life. Common masticating and centrifugal juicers and blenders have high operational ratings, anywhere from 1,000 to 24,000 revolutions per minute. The heat and/or impact shock destroy nutrients and enzymes. Green Power operates at a low 110 RPM, resulting in the highest possible nutrient and enzyme content in the juice. 6. Easy to Operate Easy to Clean Not all juicers are the same when it comes to ease of operation and cleaning. Cleaning Green Power requires not much more than a quick rinse of parts under the tap, and can be accomplished in less than 5 minutes. In addition, more frequent juicing and cleaning sessions are required with inferior high RPM juicers This is because the juice they produce rapidly loses it's nutritional value and therefore should be consumed immediately. Fresh Green Power juice retains a high nutrient and enzyme content for up to 2 days. This means instead of juicing 3 times a day, you can do it once every 2 days which means you clean up less often. And Green Power juice can be frozen with more nutritional value intact. 7. Additional Benefits What else can it do? Are useful accessories and attachments included? Can it make pasta, nut butters, desserts, baby food and rice cakes? When you buy a Green Power Juice Extractor, it comes with all the necessary accessories and attachments. Green Power is the most versatile juicer on today's market, and comes complete with a two year warranty at no extra charge.